I was flipping through my sketchbook and found some old sketches/ ideas that didn’t make it to my picture book, this was one of them. So I turned it into a black & white drawing instead. Those of you who loved my earlier works of simple black & white line drawing style, this one is for you. I spent a rather long time on this piece mainly trying to get the desired colour; I’d wanted a night sky but I also wanted sunrise to symbolize new beginnings... And then there were the many details on the uniform which took me more time. I really like how the whole piece turned out. I hope you like it too. 1. It has to be animal related. No violence/ cruelty of any kind please. It can be a topic to raise awareness for animal welfare (just a thought). 3. Be as imaginative and whimsy as possible coz that’s my style! It can be a personal story, something you experienced in your dreams or, just be creative! . Feel free to throw in as many ideas as you like. You can comment below my post or DM me your idea. If your idea gets chosen, I will credit you AND draw you inside. Click on #dollgift_ihaveawish for some ideas! For this piece, besides wanting her hubby & her to be holding an USA and Korea flag, client hoped to have the continent of North America and Asia to be incorporated into the artwork. I suggested a sunrise background to symbolize a new beginning for their upcoming adventure and also a pier since it was where they had their wedding shoot. I want to take this opportunity to say a very big thank you to this very sweet lady @didel613. This was the 3rd time she engaged my service - each time she’d given me her full trust and the absolute freedom of expression, not to mention she’s always full of appreciation for my effort. Thank you also for the permission to share your lovely message (scroll down to see her message). This was just one of the many sweet notes she’d sent me!). My heart is full. I wish you and Taylor (hopefully your 3 doxies too!) the very best for your exciting journey ahead, Diane! Don’t forget to send in your ideas if you’d like to see them illustrated for my book. Details #dollgift_ihaveawish . Follow me on IG for progress of my book! Thank you for all your input for my book! Please keep them coming. I have visuals for some of your ideas already! :D Meanwhile, here’s another one for you. It’s a re-work from one of my earlier pieces which I thought would go well with this book. ‘I have a wish. I wish to be the brightest star in the sky so I can be your guiding light.’. Remember to follow me on IG for progress of my book #dollgift_ihaveawish! 1. It has to be animal related. No violence/ cruelty of any kind please. It could be something to raise awareness for animal welfare though (just a thought). 3. Be as imaginative and whimsy as possible coz that’s my style! It can be a personal story, something you experienced in your dreams or, just be creative! I’ve done up a sample for you. Image 1 - ‘I have a wish...’ Image 2 - ‘I wish my teddy bear could come to life and we would go on adventures together.’ You can comment below my post or send me your idea. Send in as many as you like. If your idea gets chosen, I will credit you AND draw you in as the character. Honestly I have no idea where this is going or if I’ll be publishing the book at all. But I do know for sure I have to start taking baby steps OR I’ll just continue to sit here and procrastinate. If this is something that interest you, start throwing me your ideas. Also, please help to get this message out so we can have more people join us. I’ll post whatever I can come out with as we go along. Have fun! 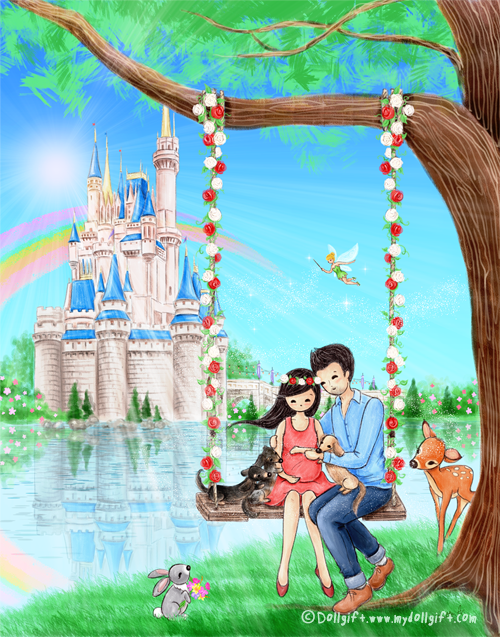 Commissioned family portrait: Baby announcement with Disney/ Spring theme. This is another surprise gift order (so much love lately!) from a sweet husband to his beautiful wife who will be due in April. (Okay someone finds me a husband like that pls! Ha!). This has to be the most detailed piece I’d ever done thus far and I’m very happy with the result. I was told this morning that his wife received the art piece and was in happy tears. Knowing that clients love their order and appreciate my effort is the most rewarding thing for me. I’m not going to tag them in this post until they make the announcement themselves. I’m so excited for the arrival of their baby! Thank you again from the bottom of my heart. I love this piece so much too. I would like to thank everyone who made me smile in 2017 - your support and encouragement has definitely filled my days with love and warmth. May 2018 brings you great adventures, new aspirations, lots of joy and furry kisses! A shoutout to an amazing friend who bakes delicious cakes (and macarons!) at Oven Artistry. If you reside in Singapore, please show these humble, passionate home bakers some support. Oven Artistry uses only the freshest and finest ingredients; think Valrhona (French) chocolate! I also love that their cakes are rich in taste but not overly sweet. If you feel I’m being bias because the baker is my friend, try it for yourself and let me know what you think. 😉 They are taking orders for their log cakes now - Chocolate Hazelnut or if you like some alcohol, try their Lychee Vodka flavour. You may contact Alivia at 9799 6393 or drop them a message on their FB page, www.facebook.com/ovenartistry. Remember to say my name (Charllotte) to receive a free set of postcards with my illustrations when you place your order. Hurry! Free postcards while stock last! Please help us to spread the message too. Thank you and love you guys!